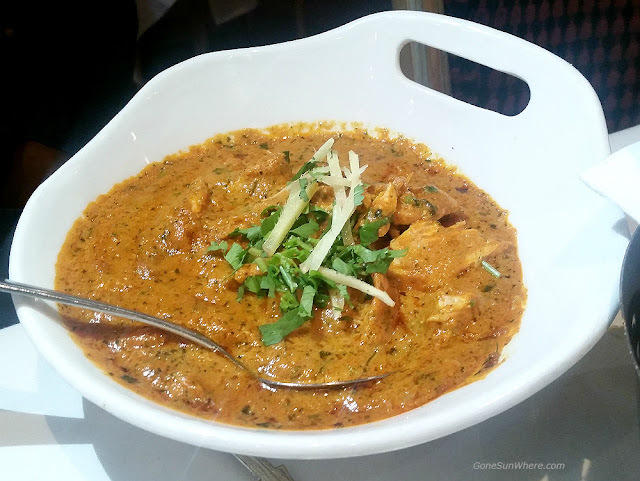 Gaylord is one of London's longest running Indian restaurants. Still going strong after 50 years. Gaylord is located in the heart of bustling West London. It's the perfect restaurant to combine with a trip to nearby theatres. Gaylord is ranked as one of London's best Indian restaurants. It's elegant setting is perfect for a romantic date at any time of the day. 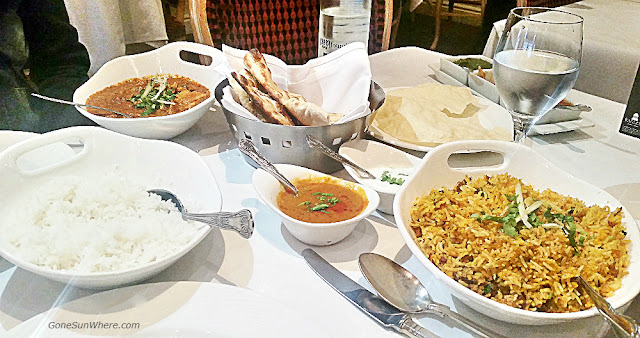 The extensive menu at Gaylord brings the finest North Indian cuisine to London. With vegetarian options and their own brand of wine on sale. After some enjoyable sun drenched days here in London we were hit with a grey. Wet. Miserable day more typical of London. Popping out for a curry seemed all the more appealing if ever a reason was needed. 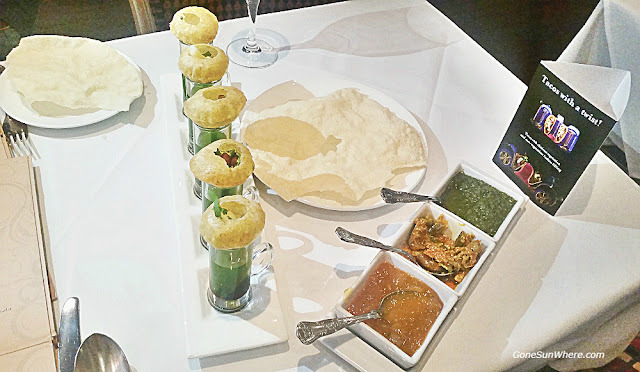 One of London's top Indian restaurants - Gaylord was due to celebrate their 50th anniversary in June 2016, and I was invited to enjoy a tasty Indian lunch. complimentary poppadoms made their way to our table. Accompanied by three delicious sauces. The mango chutney tastes lovely, with real mango pieces and it's not too sweet. The mint coriander is a delicious tasting sauce that has a distinct flavour. The mixed pickle sauce is very sharp tasting, but enjoyable. I like the fact that all three sauces really differ from one another. 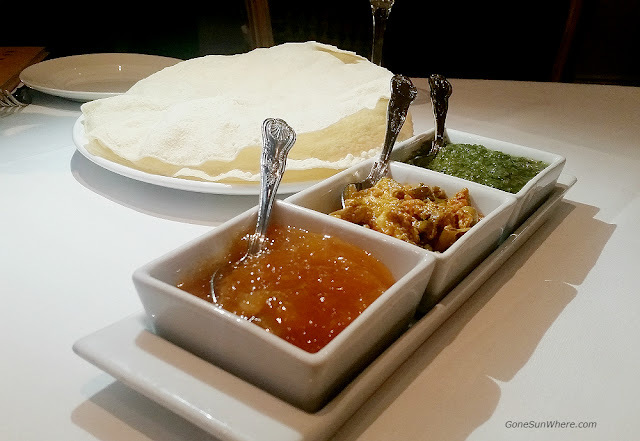 It's also great that complimentary poppadoms make their way to your table as you're seated, so that those who are feeling famished can nibble before their food comes out. We tried some Golgappa shots, which are unique and very photo worthy. You can enjoy them with or without alcohol. An aromatic puff ball with chickpea and potato inside it, sits on top each shot glass. 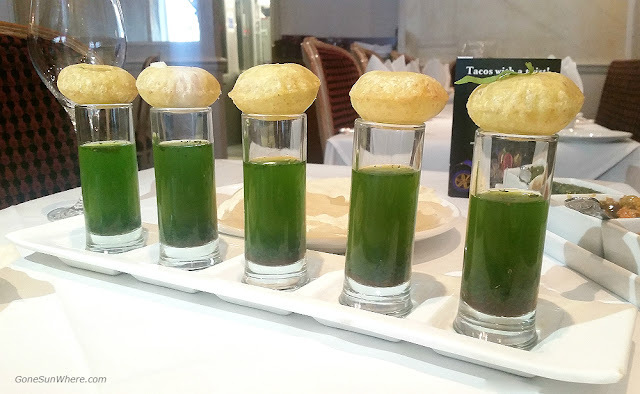 The golgappa shot at Gaylord restaurant is wonderfully unique tasting. With noticeable herbs and spices and a warming, spicy kick. Very welcome on a muggy day. To drink at Gaylord restaurant, I also enjoyed a gorgeous rose mojito. It's new to the menu at Gaylord Fitzrovia and gets a positive review from me. The rose mojito at Gaylord Fitzrovia is something I'll definately order again. It's so delicious, with real rose pieces that taste rather pleasant. The rose mojito has a light, but noticeable floral taste and a welcome sweet taste of raspberry. I'm so glad our waiter suggested the rose mojito to me instead of the tamarind mojito I was originally going to order. My husband had the tamarind mojito, which is great in that its a unique cocktail. However, its a little salty and I like my cocktails sweet. The menu at Gaylord Fitzrovia is extensive, which can only mean one thing. It's on my list of places to come back to. We ordered a paneer jalfrezi taco for starters at Gaylord. 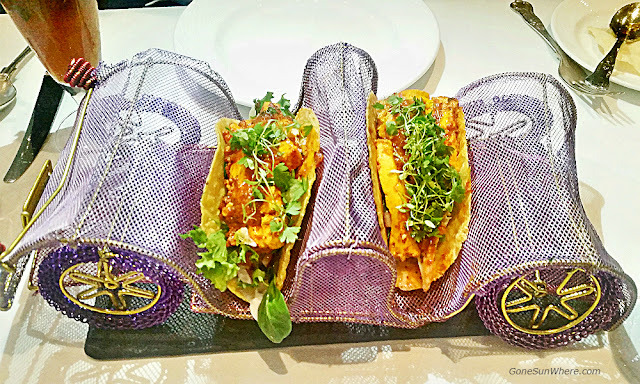 The yummy tacos come served in a colourful car with purple and gold caging. The paneer jalfrezi tacos at Gaylord restaurant are deliciously light, crisp and buttery with paneer cheese that tastes like chicken! The jalfrezi sauce is tasty and fresh herbs, onion and lettuce finish it off. For the main attraction I was spoilt for choice, but settled on a lamb biryani, which comes mixed with rice and serving of raita - a yoghurt sauce. The lamb is perfectly tender and the spices in the lamb biryani slowly creep up on you. 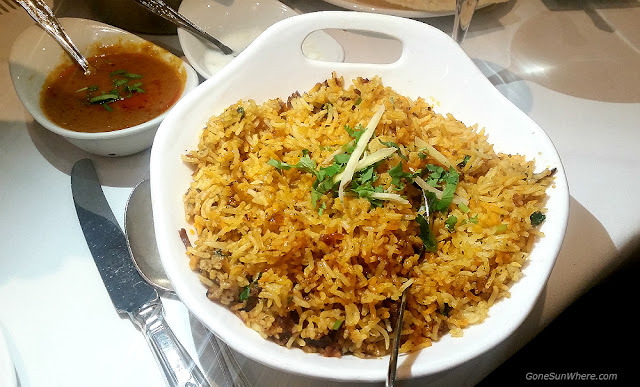 I really enjoyed the lamb biryani at Gaylord restaurant. The tangy, zesty raita yoghurt was a refreshing and welcome addition to the meal. My husband enjoyed a tasty butter chicken, with some creamed rice, and when I say he enjoyed it. I mean he enjoyed it! The creamed rice was the most perfect rice. Fluffy and buttery tasting. The butter chicken was as good as butter chicken gets. Delicious, with mild, yet satisfying flavours. We also shared a thin roti which is identical to naan bread in my opinion. It tasted pretty decent. After an enjoyable lunch at Gaylord restaurant Fitzrovia, I can see why Gaylord is one of the top ranked Indian restaurants in London. Everything! Presentation. Flavour. Service. Mojito lovers should definitely try the rose mojito from Gaylord. Found this Gaylord restaurant review useful? Share this travel and lifestyle blog with others. 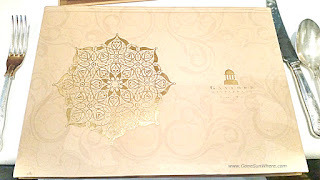 The photos of food in this blog post which were taken at Gaylord London. Along with any text and personal opinions about Gaylord restaurant and menu are copywritten by said owner of www.gonesunwhere.com The photographs and text on this blog must not be copied. Distributed. Sold or printed without prior written consent of this travel and lifestyle blog owner. Contact this site owner for more details.